And “The Strip,” an amazing dive. A low wedge of coral in the midst of the sand, about 200 feet long and 25 feet wide, it overflows with fishes in the daytime. 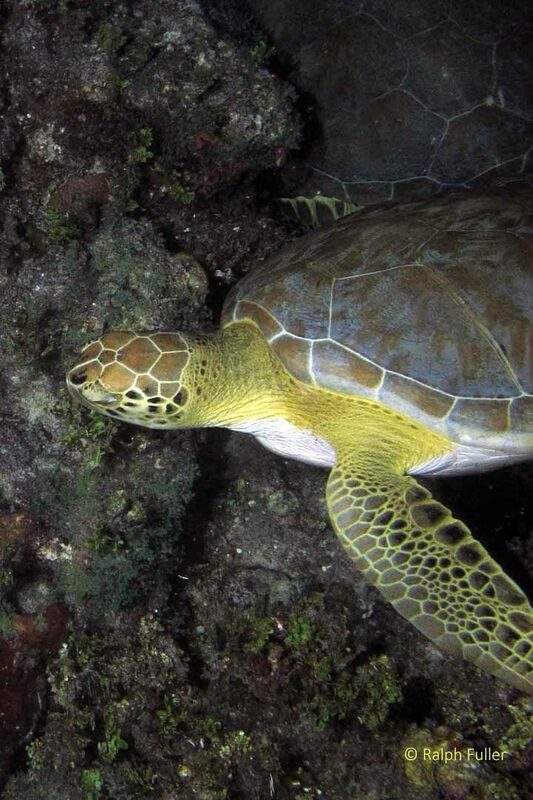 At night, the fishes are mostly gone and other reef denizens come out. MORE OF JUST ABOUT EVERYTHING I’ve been diving since 1993, and I encountered more sharks, turtles, stingrays, lobsters and spotted eels on this trip than on any other. And many species of fishes. I suspect that since the coral heads are essentially underwater oases in the middle of a sandy desert, life gets concentrated on them — making for excellent marine life sightings. 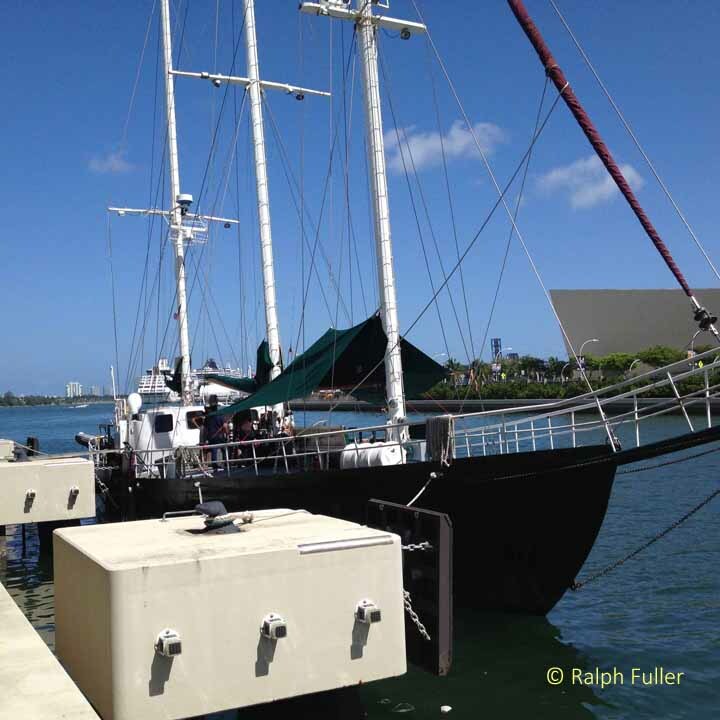 The Juliet at its home berth in Miami. 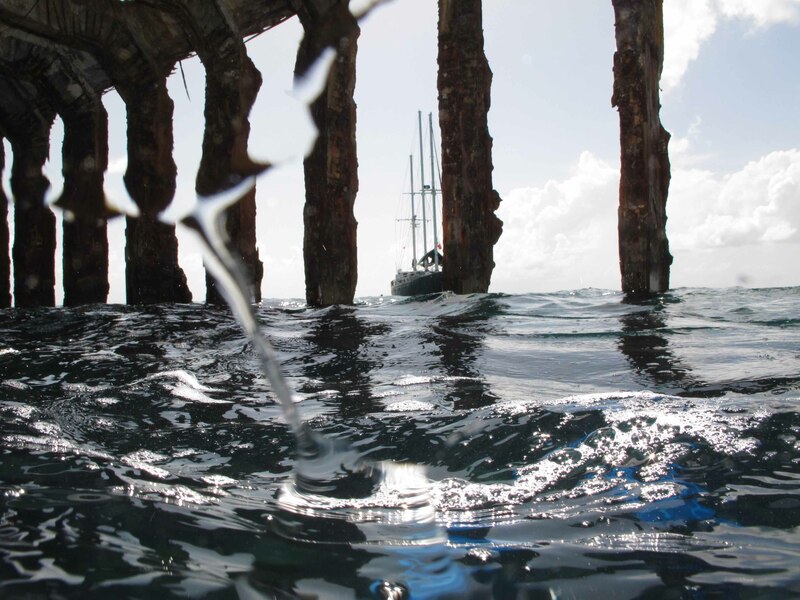 A UNIQUE LIVEABOARD A three-masted schooner built in 1974, and a dive boat since 2003, it carries only 12 divers, sailing out of Miami, across the Gulf Stream to the Bimini chain, on the western edge of the Bahamas archepelago. THE SAPONA The Sapona was one of 19 freighters built out of concrete by Henry Ford during World War I, at a time when steel was in short supply. Eventually, it was sold to Al Capone, who used it as a casino and brothel in Miami, and for bootlegging during Prohibition. You can swim inside it, getting a view of the Juliet through its ribs. 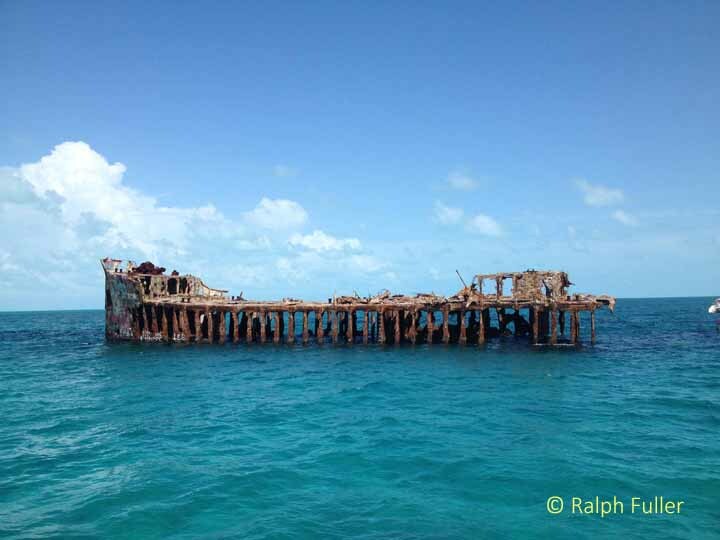 Eventually, it ran aground and during World War II the U.S. Navy towed it to its present location near Bimini for use as target practice. It’s in about 15 feet of water, a shallow dive. Above water it’s deteriorating badly. Below the waterline it’s basically an intact cement wall. Located on the western edge of the Bahamas archipelego, the Bimini chain not only Bimini itself abut series of small cays, many uninhabited. Some coral heads are so large you can’t swim around them in one dive. Or, you can swim from one to another, crossing the intervening sand. Above the reef, a school of boca. There were grunts, lots of grunts. Bigeyes on the Miami Rita wreck. It’s usually hard to photograph black durgonfishes, but this one stayed still near a crevice and I inferred it was guarding an egg nest. A hogfish in a mottled phase during the night dive on the “Miami Rita” wreck. On the night dive on The Strip, we encountered this spotted eel sneaking up on the tang in the background. It struck quickly and there was no more tang. My new BFF, a southern stingray, sat there and posed for me He was about four feet across. Basketstar on a night dive. Another new friend, a conch that was very interested in his visitors. 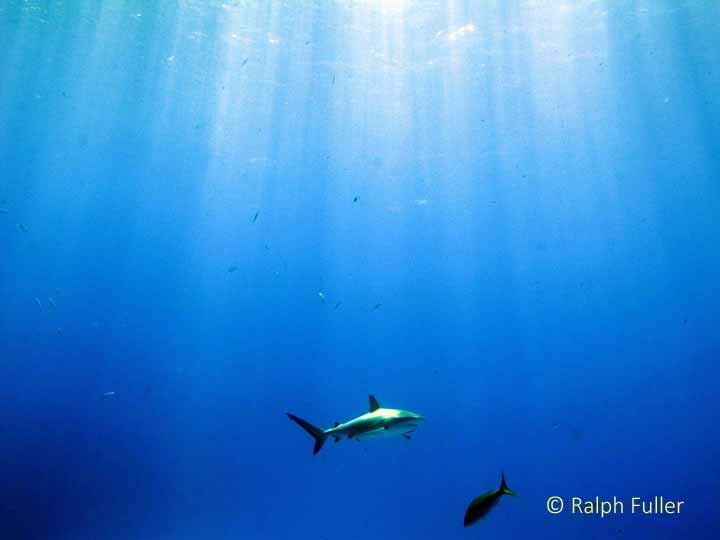 Caribbean reef sharks showed up on a number of occasions. Mostly they were looking for an easy meal – not divers, but handouts, like lionfishes. Colin tried to set up an underwater group shot with the camera on a timer. This guy popped through. Colin and Suzanne watch a visitor…very carefully.